Promotional poster for the Sampoong Apartment Building with Stores : Promotional poster for the Sampoong Apartment Building with Stores 을 보여줍니다. Detailed Information: Detailed Information을 보여줍니다. 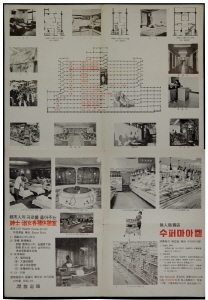 This is a poster displaying photos of the external appearance and internal structures of the Sampoong Apartment Building with Stores. The building was constructed as part of substandard zone renewal projects and completed in 1968 with a construction cost of 612.4 million won. It was a modern commercial and residential complex building with a total floor space of 10,470 pyeong (34,612 m2), 13 stories above the ground and one below. This poster introduces the modern architectural structures and a host of amenities housed in the building. According to the poster, the building has an education center that sells goods for kids and students on the third floor, an underground supermarket, sauna facilities, and elevators and escalators, with offices and residential spaces on the upper floors. With parking facilities that could accommodate a maximum of 200 vehicles, the building was considered a state-of-the-art apartment building at that time. The words “Seun Market District 3, Sampoong Apartment Building with Stores” are printed in two rows on the upper right of the poster. This poster offers a hint at the architectural structures of early apartments and housing culture in Korea at that time. 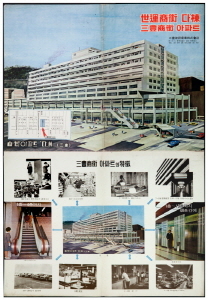 This is a poster promoting the structures and features of the Sampoong Apartment Building with Stores, which was completed in 1968.